When asked to name a girl group, one of the first names to come to mind is the Spice Girls, or maybe The Supremes, but when asked to name one of more recent times, I have to stop and think. If you do as well, hopefully this list will help you out. Okay, I was certain that it was just the three sisters from California and then I looked them up and discovered the drummer, but we’re just going to forget about him for a moment. Check them out. Sarah Blasko, Holly Throsby and Sally Seltmann – it’s basically a supergroup. 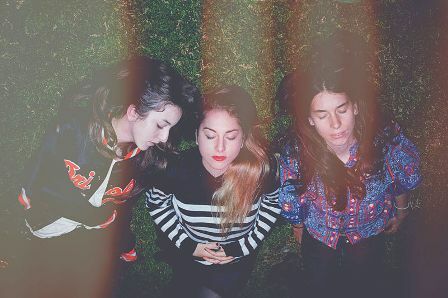 These four sisters from Victoria won Triple J’s Unearthed High as Iotah in 2010 and took the small step from there to playing at Glastonbury the next year. Need I really explain how great these two are? I actually thought these guys were done and dusted, but I see them reblogged on Tumblr a hell of a lot, and it turns out, they have a new album in the works. These guys are interesting. There’s a ’60s vibe happening with a bit of…something else thrown. I can’t quite put my finger on what that something is, but it’s worth a listen. I’m not really into them, but I’ve thrown them in for the sake of variety. The three sisters from Grafton, NSW have done pretty well on the Australian ARIA charts, including hitting number 2 and Gold status with their second album. Sisters again. Indie and beautiful and whimsical and listen. Now. You know that song ‘Change Your Life’ that played a least a thousand times during an ad for a reality show? I don’t remember the show (I’d take a stab at House Rules but I could be wrong) but I do remember the song. That’s these ladies. I’m not normally one to advocate for reality show throw together groups, but I figure not knowing their origins before I considered them for the list must speak for something. Re: Haim – Pretty sure he’s the touring drummer- Haim sisters write and record all the percussion and all play drums like wow. Lots of great acts here – and some I’m going to have to check out! Just thought I’d point out that the difference between a girl group and a band with only or mostly female members is significant. I find it problematic to lump in the two, because then we’re reducing two completely separate concepts to the gender of the artists involved. Bands like Haim and Tegan and Sara, for instance, who write their own songs and play their own music, are incomparable to a manufactured group of female singers. (Not that there’s anything wrong with the latter! They’re just different things.) I feel that this piece should have been either a list of girl groups or a list of female-driven bands. Also, I’m not sure about throwing in an act you don’t even like in a top 10 list – I find that this implies that that there aren’t enough female groups to fill the list, which is again problematic. Also, if this is a list of girl groups from recent times, why are the Andrews Sisters on it? I’m sorry if this is too critical as I’m sure these were all unintentional oversights. Just something I thought worth pointing out for future reference. Eons ago I wrote this article on the subject: http://www.collapseboard.com/blogs/the-problem-with-‘girl-bands’/ It’s terribly written and vaguely cringe-worthy for me to read over again, but it summarises my ideas on this concept well enough. This entry was posted in Music, Opinion and tagged lip top 10, music, Opinion. Bookmark the permalink.